Stand out at your haloween party! We have wigs and make up that can add that extra touch of reality to your halloween costume. 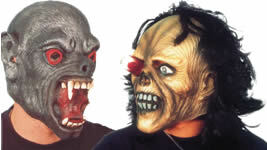 Our selection of masks will scare your friends (they certainly scare us). 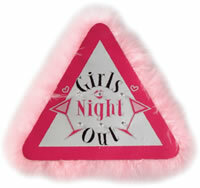 Let's Party is the largest retail party shop in Scotland. 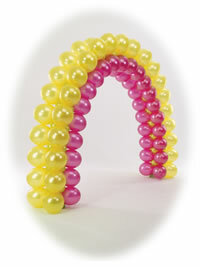 Based in Stirling we specialise in Party Supplies, Fancy dress and Balloons for all occasions! More plates, cups, napkins, table covers, invitations, balloons. ..In short. More of everything to make parties fun and memorable. 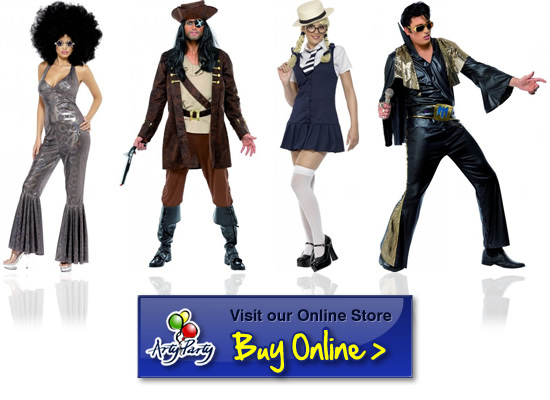 Let’s Party of Scotland carries a wide range of fancy dress to buy for both adults and children. 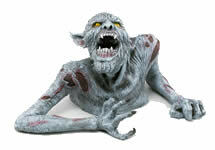 We have a wide range of room decorations to spice up your halloween party. Whatever you are looking for, from Halloween Costumes, Superheroes Fancy Dress to Spongebob and even Borat Mankinis, lets party help you with all costume and fancy dress requirements. We stock a wide range of latex balloons suitable for air fill and also decorator quality latex and foil balloons for filling with helium.